Perfect Lifestyle & Location - Leave Your Car At Home! Promising lifestyle excellence in a walk-to-everywhere setting, this delightful unit is big on appeal and convenience. Just move in and enjoy! ~ Generous master bedroom with a walk-in-robe and direct access to the spacious main bathroom with a separate bath and shower. ~ Remaining bedroom with built-in-robes. ~ Modern kitchen offering a Fisher & Paykel dishwasher, stainless steel oven and an abundance of cupboards and bench space. ~ Open plan lounge and dining room with split system heating & cooling. ~ Lovely outdoor entertaining area with a desirable northerly aspect. 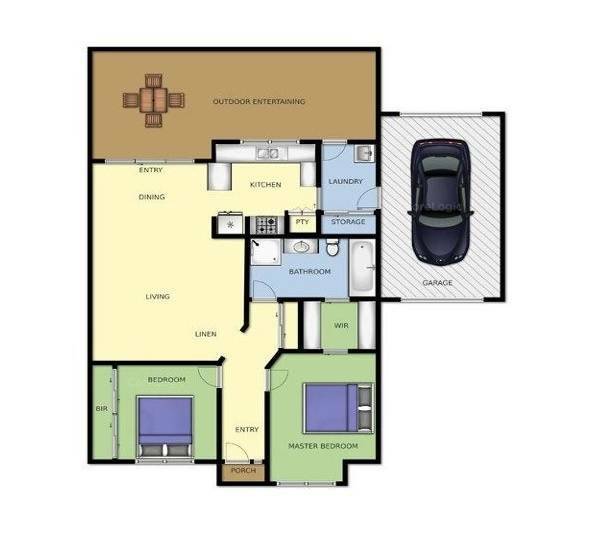 ~ Single remote-controlled garage with roller door to the rear courtyard. ~ Further features include security shutters on the external windows and plenty of storage throughout. ~ Only 100m to Bittern Fields Shopping Complex and 120m to the Railway Station & Sunday market.